Mad as a box of frenzied frogs, or unblemished, unquestionable genius? That is probably the question most people ask themselves on first hearing Therion. I was introduced to them by our former Reviews Editor, Paul Jerome Smith, back in 2014 (he played me 'Lemuria' from the album of the same name). The music was totally unique to my ears, and although Metal wasn't (and still isn't) my preferred genre, something stirred deep within me (oo er!! ), and I quickly proceeded to acquire as much of their back catalogue as finances would allow. Therion (for the uninitiated amongst you) hail from Sweden, and Christofer Johnsson is its primary innovator. Since their inception (as Blitzkrieg and Megatherion) in 1987 he has been the constant throughout. To name all his associate musicians and choir members during the ensuing years would be like introducing you to the entire cast of extras from Ben-Hur! Suffice to say, Johnsson has always surrounded himself with a vast supporting cast, representing some of the best Metal musicians and Classically trained backing singers that Scandinavia has at its disposal. With an impressive discography of fourteen studio albums, and a further three live albums, the question must be, "why re-issue these two albums now"? Both 'Theli' (1996) and 'Vovin' (1998) were recorded and produced at a time of great renovation for the band. The Death/Doom Metal tag that was quite rightly placed upon them was beginning to weigh heavily on Johnsson, and his vision of expanding both the physical and stylistical elements of the band drove him unwaveringly on to a transformation that would subsequently seize a greater following and harvest critical acclamation. 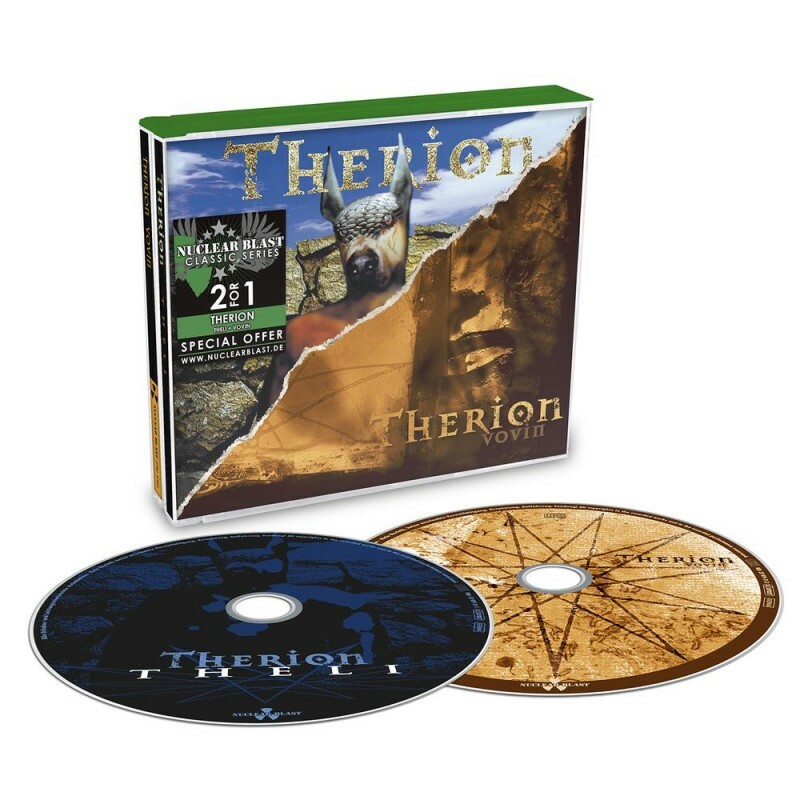 With 'Lepaca Kliffoth' (1995), their first album on the renowned Nuclear Blast label, Therion began to experiment with the integration of Classical music and choirs into their formidable, often fast-paced Metal, but it wasn't until 'Theli' was released that the soundscape they are now renowned for really began to materialise. 'Theli' could easily be defined in just three words; imposing, powerful and haunting. Lyrically, they embrace innumerable ancient cultures, myths and legends, but you don't need to be an intellect to become immersed. Opening with the instrumental fanfare 'Preludium', and directly followed by "fans favourite" 'To Mega Therion', the "OMG" factor immediately strikes; a pulsating rhythm section underpins quintessential Metal riffing, thus allowing both male (band) vocals and choral superfluities to shine above this frenetic underbelly. This is Therion, and this is what they do best! 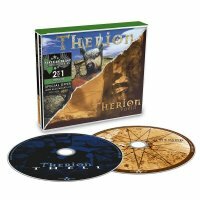 The exquisite 'Cults Of The Shadow', The Cult-esque 'Nightside Of Eden' and the predominately ethereal 'The Siren Of The Woods' are all archetypal Therion compositions; the light and shade, construction and deconstruction of intensities, and metamorphosing tempos will leave you breathless, and maybe a little flabbergasted too! Yes, the musicianship is unquestionably first class, but personally I feel it's the contribution of both the North German Radio Choir & Siren Choir that transform this album from good to great. With this particular "bargain" 2CD package there are a further four bonus tracks tagged on to 'Theli', the best of which are 'In Remembrance', with its dark, moody, yet semi-commercial vibe, and 'Black Fairy', an up-tempo blend of Axel Rudi Pell and The Darkness ... interesting! Fast forward two years, and 'Vovin' sees the band embrace and utilise the Classical/choral contrivances even further than those witnessed on 'Theli'. It can almost be deemed a chill-out album. When I say "band", in this case I should say "studio project", as Johnsson used studio musicians, as opposed to his established band. 'The Rise Of Sodom And Gomorrah', which launches the opus, is perhaps my favourite Therion track; if you imagine Metallica covering Gilbert And Sullivan's 'The Mikado' or 'HMS Pinafore', then you're on the right track. 'Clavicla Nox', 'Eyes Of Shiva', 'Morning Star' (both part of the 'Draconian Trilogy'), 'Black Diamonds' and 'Raven Of Dispersion' all display Therion's softer Symphonic side, this comes curtesy of a string quartet and positions the orchestral instrumentation centre stage. But fear not Metalheads, there is still enough riffage on display with 'Wine Of Aluqah' and 'The Wild Hunt' both having galloping tempos that are supported by a sonorous, pulsating rhythm section. For the Therion virgins out there, these two albums are the perfect starting point, and I implore each and every one of you to at least give them a chance. No one amalgamates Metal with Classical like they do. It's captivating, exhilarating, awe-inspiring and it can even feel exhausting at times. But remember, at the core lies "Metal" that can often be as durable as tungsten, but when that's tempered by sublime orchestration and choral cohesion it evolves into an entity of indescribable beauty.